Such serendipitous timing (and inspiration) once again from Dr. Keith Devlin. I was in the process of writing a post about "knowing" or "proof" in mathematics... and along comes Dr. D. to finish my post off for me! An engineer, a physicist, and a mathematician are riding a train through Scotland, when they look out the window and see a lone black sheep in a field. The engineer remarks, "Hmmm, I guess in Scotland all the sheep are black!" The physicist replies, "No, no, no! Only some Scottish sheep are black." To which the mathematician, rolling his eyes at his fellow travelers' sloppy logic, chimes in, "All one can say is that in Scotland, there is at least one sheep who has at least one side that appears to be black at least some of the time." As often happens in comedy, the humor stems from an intrinsic kernel of truth... that mathematicians, unlike philosophers, physicists, and others, really are constrained by a stricter regimen of logic and deduction than prevails elsewhere. Of all the sciences, "induction" is probably least acceptable in mathematics, even though reams have been written about the philosophical shortcomings of induction more generally. One can't conclude just because the first billion values plugged into the Riemann Hypothesis hold true, that therefore the hypothesis IS true, or if the first trillion digits of pi reveal no pattern, that by itself, wouldn't mean there was no pattern to pi. In fact, and sometimes hard for the layperson to comprehend, in mathematics, "billions" and "trillions" and the like, are really very very very very tiny numbers anyway. A classic example of what mathematicians are up against was the 1885 Mertens Conjecture, which proposed that the sum of the first n values of the Möbius function had an absolute value of, at most, √n. ALL human/computer calculations support the conjecture, but 100 years later, in 1985, Andrew Odlyzko and Herman te Riele theoretically disproved it. So despite the fact that ALL calculations affirm the conjecture, somewhere out there is a "bad" n with a currently known upper bound of e^ (1.59×1040). You don't have to understand the technical details of the conjecture to sense the giiiiinormousness(! ), of that upper bound value. Again, it means that even though the conjecture is TRUE for ALL values ever (so far) plugged into it, it's now known that somewhere out there lies some value for which it is UNtrue. Anyway, the word "proof" or "proves" has been an annoying pet peeve of mine across the years. There are NO proofs in science. There is simply the aggregation of evidence... "induction" is certainly rampant, but proof, not so much. E=mc^2 is NOT proven. Evolution is NOT proven. The existence of the moon, or for that matter my own existence is NOT proven... they just all seem to be the case given our perceptions/interpretations. The philosophical endpoint-conundrum here is that we can't demonstrate conclusively whether-or-not we are anything other than a "brain-in-a-vat," or automaton, completely under the control of a much higher Martian being. What we call "proof" is, at best, a notion residing in the self-enclosed, essentially tautological realm of concocted logic and math. I once left a comment on a well-known scientist's blog when he wrote about something that was true and proven in physics. I took issue saying that technically it wasn't proven, but simply had a vast preponderance of evidence supporting it (as we perceive the evidence). His response (paraphrasing from memory) was that "Well, of course if you mean 100% absolute metaphysical proof you're right, but nobody seriously uses the term in that sense in everyday parlance, so for all-intents-and-purposes it is proven." And that of course is my beef, that "proof" has been so watered-down, polluted by language and argument, that its precise meaning is lost, and we ought, whenever possible in science, deal in precise, not compromised, meanings. Recently someone in a Twitter stream stated something to the effect, 'Philosophy deals with ideas, physics with evidence, and only math with proof.' I came close to re-tweeting it, but in the end didn't feel comfortable enough with it. And one reason it didn't 'feel quite right' has to do with Keith Devlin's latest posting where he takes discomfort with the word "proof" to the next level, essentially saying (and I hope I'm not mis-stating him here) that induction and imprecision inescapably raises its ugly head even when and where we are unaware of it, including mathematics. Early on he says, "These days I have a very pragmatic perspective on what a proof is, based on the way people use them in the day-to-day world of mathematics: Proofs are stories that convince suitably qualified others that a certain statement is true." "Proofs" as "stories" -- I love it, and surely a new way for most folks to wrap their brains around the term. Dr. Devlin spends the rest of the post fleshing out the idea. I suspect the average bloke won't get much from Dr. Devlin's message, but for scientists and mathematicians I think it must-reading. It's been awhile since Dr. Devlin had posted new blog entries. And reading these two pieces from him I almost feel like an addict who was long overdue getting a 'hit' from his drug-of-choice (and I mean that positively! ;-) I feel refreshed and reinvigorated just reading these two posts! P.S. : so far as I'm aware the word "proofiness" was originally coined by Charles Seife in the title to one of his popular books. ADDENDUM: in the course of an email someone mentions that they're not clear what my point is above since it seems like Dr. Devlin's view (of 'proofs as stories') contradicts my initial stance that "proof" is a more stringent term in math than other fields. That's my fault for not making the transition more smoothly: yes, I started this post thinking I would write about why the term "proof" ought be strictly relegated to mathematics and logic, and NOT used in other sciences nor in everyday parlance... but before I could wrap it up, along came Keith to say that e-e-e-even within mathematics "proof" is an inexact term, not being applied quite as people envision. I thought that was an awesome (and subtle) point and a better wrap-up than what I'd had in mind -- and I don't think it's so much a contradiction to my point, as it is yet a further extension of how loosely "proof" gets bandied about. Hope that helps. 11) Will just note, in closing, that one of my favorite fun mathematical reads, Simon Singh's "The Simpsons and Their Mathematical Secrets" is newly-out in paperback. 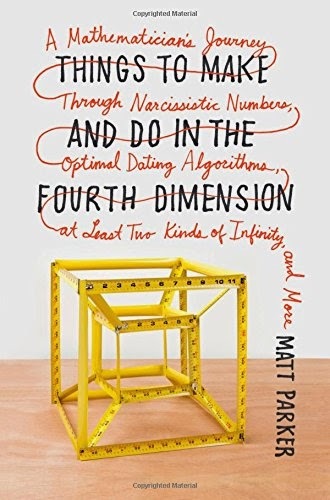 Another great possible stocking stuffer for any math fans on your Xmas list (...if there's even anyone left who hasn't already read it). I don't usually hint ahead of time what the Sunday Reflection at Math-Frolic will be, but I will say that this coming Sunday's will be in tribute to Gardner, including the above video, in honor of the Centennial of his birth which arrives on Tues.
1) Have mentioned Steven Strogatz's 2009 "The Calculus of Friendship" multiple times in the past (at Math-Frolic). I read a library copy quite some time ago, and always wanted my own hard copy... delighted to now have it. Recommended to teachers, students of all stripes. 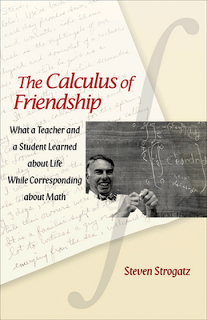 And if any of you think it's just a simple, sentimental story, NO, it actually includes real math along the way, as only Dr. Strogatz can tell it (but, yes, buy it for the beautiful story, the math is a bonus!). Really, no math-lover should miss it. 2) Richard Elwes consistently amazes me with his knack for math explication. 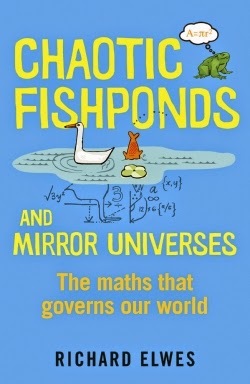 The book I ordered is his 2013 "Chaotic Fishponds and Mirror Universes" (subtitled, "The math that governs our world"), and so far, it is way surpassing my expectations (the title doesn't do it justice!). A splendid diversity of engaging topics made timely. Richard is British, and for reasons I don't fathom, his books often don't get very wide US distribution -- absolutely ashame! One of the best popularizers out there! Come on American distributors. As we get close to the end of the year, Jordan Ellenberg's "How Not To Be Wrong," thus far remains my top popular math pick for 2014... BUT IF Elwes' book were from this year instead of 2013, it would be in the race for that designation! Another great choice for any young math-lovers on your Christmas list. 3) Finally, one of my old stand-byes: Renaissance-man and logician-supreme, Raymond Smullyan -- I have enough of his puzzle books, but ever since reading his Taoist-inclined, "The Tao Is Silent" (1977) I've wanted to read more of his output on spirituality. 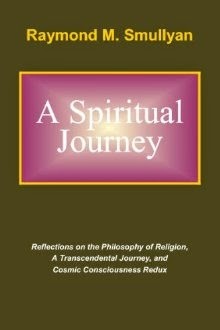 The book I got, "A Spiritual Journey" (2009), is essentially three small books in one: the first part focuses in a general way, on the philosophy of religion, the second part is on Ralph Waldo Emerson and Transcendentalism, and the last part is on Richard Bucke's notion of "Cosmic Consciousness" -- it won't suit everyone's taste, spirituality being such a personal matter, but if you liked Martin Gardner's "The Whys of a Philosophical Scrivener," you will likely enjoy this offering from Raymond, which so closely mirrors my own views and Gardner's (though the writing is a bit stodgier, less smooth and concise than Gardner). No math here either, but Smullyan on ANYthing is worth savoring. There are of course plenty more recent top-notch 2014 popular math books on the shelves to choose from... but always fun to catch up on things one has missed from the past. Smullyan is now in his mid-90's with the quick, lucid mind of someone half-his-age, Strogatz is 55, and Elwes is the kid on-the-block at 36 -- each very different in style and interests, but each leaving us an outstanding body of work for our enjoyment and elucidation. Thanks guys, you've given me Christmas in October! From my perhaps-objective(?) perch outside the whole education system it seems that the opponents of Common Core are more organized, more unified, and more vocal than the supporters, and that will be a difficult combination to overcome in the current political climate (education being highly politicized) -- so, while I think supporters of Common Core will win this war (such as it is) in the long-run, in the shorter run, I suspect they'll be losing many battles. And one last piece of book news... Ian Stewart has yet another compendium of math puzzles out: "Professor Stewart's Casebook of Mathematical Mysteries"... looks like a good collection, some classic and some fresher, or at least newly-rendered. If you've enjoyed his other volumes, or like math puzzlers more generally, give a look; or, if you're thinking ahead to Christmas, might be a good choice for some math lovers on your list! ...these should keep you busy for awhile. William Poundstone... Eclectic Writer and Paula's Cousin! "Our inability to recognize or produce randomness is the most invisible of problems. Randomness is like air, all around us and never noticed until the gale hits. We are not prepared to connect our difficulty with randomness to the real world of missed tennis serves, bad passwords, and Ponzi schemes." -- William Poundstone, from the Epilogue to "Rock Breaks Scissors"
William Poundstone is one of my favorite writers (twice nominated for a Pulitzer), and one of the more eclectic folks I've had the pleasure to interview here. He has explored an odd and wide range of topics in his writing, but is not a mathematician nor mathematical writer per se, so many readers here may be unfamiliar with him. Still, his topics often impinge on underlying mathematics, while having an uncanny way of also sliding between the boundaries of science, logic, psychology, philosophy, and finance/economics. I reviewed (and enjoyed) his latest work, "Rock Breaks Scissors," HERE. Another of his books, "Are You Smart Enough to Work at Google?" was dedicated to the memory of Martin Gardner. 1) Information on your background has been surprisingly hard to come by! (though I did learn that you studied physics at M.I.T. before becoming a writer). Your book bios and Wikipedia page don't have much info on your past, and even the quirky "about me" page at your personal website doesn't divulge much. Is that because you're secretly a CIA-operative? ;-) Seriously, can you fill readers in a little on your background and how you arrived at the interests/writing-life you have today? Well, without saying too much about my age, I have been a full-time author for longer than the World Wide Web existed(!) I suppose that's why there's not much web presence for my pre-author life. I did spend a year as an editor (with Brentwood Publishing, now defunct, which produced trade journals). I found that very useful as it taught me fine points of grammar and usage that I never learned in my formal education ("that" v. "which," "vale of tears" not "veil of tears," etc.) As to my interests, I was a big reader from the time I could read, in science especially. 2) My favorite work of yours is an older one, "Labyrinths of Reason." And like it, many of your volumes touch upon human reasoning or logic to some extent. How did you go from M.I.T. physics to such a psychological/philosophical focus? I'm glad to hear you mention Labyrinths. It remains one of my favorites too. The book is about how we know what we know, and that's always an issue in physics. Things like quarks started out being a mental shorthand, a way of getting the right answer. By pretending that quarks, which you can never see or isolate, exist, you can make accurate predictions about the entities that you can see and measure. So it started out as fiction and became "nonfiction"—at least, we agree to call it that. One of my favorite Stephen Hawking quotes: "Reality is not a quality you can test with litmus paper." 3) As a full-time writer what is your typical (if there is such a thing) workday like? Do you have a set routine? I get up about 6 AM, read the news, work out on a treadmill, and am generally at work by 8. I work until about 5, but it's not all writing/editing. I do a lot of reading, I do interviews (of people I'm writing about, or giving interviews to promote my books). 4) Your agent is John Brockman. I've long-enjoyed his books and Edge website. What can you tell us about the experience of working with John and the Edge group? Is it forever-stimulating, fun, argumentative, thought-provoking….? 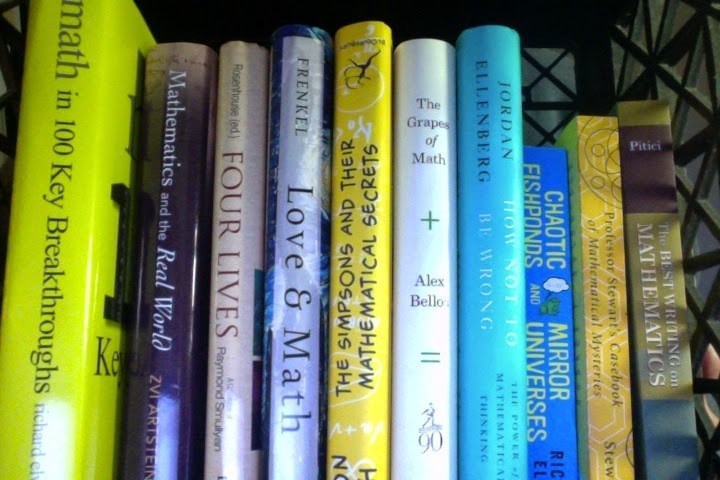 5) Many of your books hover around mathematics, but without being too mathematical or technical. Can you say how math fits into your daily or intellectual life… is it front-and-center to a lot of your thought, or more lurking in the shadows of the things that most interest you? Also, do you still follow physics these days, and have any thoughts on the controversies/debates surrounding modern cosmology -- especially in terms of certain recent writers who argue that some high-level physics is bordering on metaphysics or pseudoscience? I do take a quantitative approach to a lot of things — not to everything, which would be nuts, but to things where many others might not. Counting grams of saturated fat and carbohydrates comes to mind. And definitely, as I say above, I think the (meta)physics debate over what is real is interesting. How can one show that string theory, or the many-worlds interpretation are worth pursuing? Everybody says they're for Occam's razor, but that 14th-century implement doesn't cut it in today's physics! For one thing, it's not always clear what it means to minimize assumptions in physics far removed from direct human experience. Also, as a practical and even careerist thing, you often have to put an awful lot of work into a theory before you find out how simple it is—or isn't. 6) One curiosity note: Your latest work is entitled, "Rock Breaks Scissors," but the chapter in the book on the betting game 'rock, paper, scissors' is actually only a small portion of the book -- just wondering if there's some story behind how that ended up as the title for the volume? "Rock, paper, scissors" is a game that almost everyone has played in which you're trying to predict someone else's "random" choice (which in fact isn't all that random…) Though this element exists in many other games and situations and conflicts, you encounter it in its purest form in RPS. I had thought of using the title "The Outguessing Machine," but that implies it's about machines predicting, when you can actually do a lot of the predicting in your head. 7) You've written over a dozen books, but only one biography… that of Carl Sagan. Are there any other figures you've considered doing a biography of? I had thought of doing a standard Claude Shannon biography… but this evolved into Fortune's Formula, exploring just a tangent of his best-known achievements. 8) Are you currently working on a new book, and if so, what can you tell us about it? ...sounds interesting, as this is a debate currently going on within mathematics education: how much rote memorization is still necessary given the ease with which such information is digitally accessible; should children spend more time on working mathematically/algorithmically, and less time committing facts to memory? 9) Who are some of your own favorite current authors (nonfiction) to read, and what are some of your favorite books for learning or inspiration? I read more fiction than nonfiction, and at least half of what I read isn't necessarily "current." I recently read Mark Twain's Life on the Mississippi and (from this century) Persi Diaconis and Ron Graham's Magical Mathematics and Edward Tufte's Visual Explanations. In fiction I'm reading Don Delillo's Underworld. I suppose I should take the opportunity to plug Harry Stephen Keeler. He was an eccentric American novelist that a group of friends and I "rediscovered." Keeler would break all the rules of detective fiction, in one case introducing the guilty party, for the first time, in the last sentence of the book. One novel concerns the "Flying Strangler-Baby," a little person who disguises himself as a baby and stalks victims by helicopter. There is a Harry Stephen Keeler Society with a newsletter at http://site.xavier.edu/polt/keeler/. 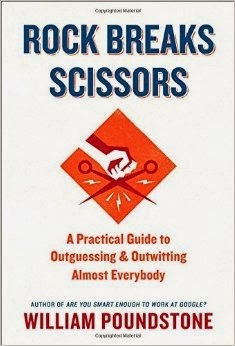 6) My own review of William Poundstone's latest book, "Rock Breaks Scissors" precedes this post. I keep seeing William Poundstone's latest book, "Rock Breaks Scissors" in the 'business' sections of bookstores… which I think is ashamed, because a lot of readers who would enjoy it may miss it there. More appropriately, and like most Poundstone books, it should be in a science/math area, or perhaps under psychology. Poundstone is one of my favorite authors; a good writer, dealing with subjects I find interesting, and at a level accommodating a lay readership. Some of his volumes are deeper and richer, and others less so, but interesting and timely. This new book is in the latter category. It is yet another of the surprising array of recent volumes dealing with probability and numbers to hit the popular book market. Poundstone isn't dealing with math or probability in an academic context, as some popular volumes have attempted, but in a very reader-friendly, real-life practical sort of way. The book is divided into two broad parts: Part 1 relates to "randomness" and part 2 relates to 'hot hand theory' -- the author tries to get across two opposing ideas that govern our actions: i.e., we often perceive things as random when in fact there is actually a pattern involved, and conversely, in other contexts of life we perceive patterns, where none exists and greater randomness is at work. The Prologue begins with some discussion of the work of information theorist Claude Shannon, but also includes mention of Bernie Madoff, as well as an entertaining, famous example from the retailer Target, a couple years back, when one of their purchasing algorithms deduced that a certain young lady was pregnant long before even her parents knew -- I mention all this simply to indicate the sort of diversity of subject that typifies this volume all the way through. Chapter 1 is a little introduction to randomness, with some focus on examples from parapsychology, and also a well-known example from psychology of how poor, people are at creating "random" sequences when asked to do so (a knowledgeable individual or professor can pick out a human-created sequence from a truly random sequence). Oddly, the title of the book stems from the quite short chapter 2 which is a treatment of the betting game, "Rock, paper, scissors," and various strategies to employ for greater success. Chapter 3 covers some of the oft-used strategies (and patterns to look for) when taking multiple-choice exams, such as the SAT. Chapter 4 offers strategies for playing lotteries -- I didn't find these very convincing (but then I don't play lotteries, so what do I know). Some chapters follow delving into certain sports actions (tennis and soccer), and then card games, again always about how to better recognize, as a player, human predictability. Chapters 11-13 are some of the most interesting ones, centered initially around Benford's Law (of integer distribution), and the ways it can be used to detect fraud, financial malfeasance, or just manipulated numbers. Anyway, chapter 15 moves on from specific hot-hand ideas to basketball betting pools (as in the NCAA March Madness tournament) -- oddly there is no mention of Tim Chartier's methods here, though they've received a lot of publicity the last couple of years. "One problem with sports betting systems is that anyone who looks hard enough for a pattern tends to find one. It might be that the Denver Broncos always won on odd-numbered days in February when playing teams named after animals. Analytics is good at finding such patterns. It's not good at saying whether you should believe in them." I think that more-or-less captures the message or sentiment of the whole second half of Poundstone's book. "Put whatever you want to buy in a retail site's shopping cart. Click 'check out.' Begin filling out the form. Make sure you enter your e-mail address but don't enter any payment information. Leave the purchase in limbo and wait for the discounts to roll in." The next couple chapters deal with pricing, followed by a chapter on predicting the future, where he notes that even professional experts are generally much better at forecasting far-off broad trends than predicting near-term happenings (which one might think would be easier to predict being so much closer in time) -- you might think in terms of predicting the percentage of heads in a thousand coin tosses versus predicting the percentage in say 10 tosses. At close to 35 pages, Poundstone's final chapter, on the stock market, is by far the longest one of the book. If you're active in the market (especially if you trade for yourself) there will be MUCH of interest here, but if you have no connection to the stock market, and talk of things like PE ratios (which the chapter is VERY focused on) cause your eyes to glaze over, then this chapter will be a yawner. Anyway, the volume is chockfull of examples and is a fairly fun romp (even if sometimes shallow and choppy) through many different, often timely, ideas. I do recommend it to folks, as I think most people will find various chapters of interest, and learn some practical or quirky tips along the way, though I can't predict ahead-of-time which chapters will be most rewarding to you, the individual reader... but then Poundstone probably could've predicted my limitation.